One of my lowest points was being a model onstage as a finalist at Miss Colombia when I was 21. That’s going to sound ridiculous, but let me explain: I had given everything to be there, and I didn’t win. I had dropped out of university, spent all day in the gym, didn’t see my friends. I had presented a TV show, toured the country in a pop band, lived a lifestyle we have been told our entire lives would make us happy. I had literally been to something called “beauty school” where they train you how to walk, how to speak, and mainly how to smile, in preparation for this final. For anyone who thinks this is what they want in life: Be careful what you wish for. Living that life is a minefield of backstabbing, jealousy, tip-toeing around people’s insecurities so you don’t make enemies, sleazy behaviour from guys, and all the worst parts of being in competition with other models. It wasn’t real, but you make compromises for the things you think you want. After I returned home from the Miss Colombia contest, I decided things had to change. I thought about what I wanted to do VS. my own egoic feelings of fame, wanting to be liked, etc. I was sitting at home and found one of my old dresses in a cupboard. When I was 14, my dad bought me a sewing kit. I started making and selling prom dresses for girls at local schools. I loved the craftsmanship and how intricate I could make the designs. I was happy to do that until I got a modelling contract at 16. My mother was a model, and modelling is highly prized in South American culture, so I thought it was the right thing to do. I really thought it would make me happy. I had presumed I could carry on designing and creating, but modelling and TV took over. Five years went by, and only when I returned from the contest did I remember what really got me excited about getting up in the morning. So I did something I had no right to do. I started my own company, spent my entire life savings on stock, and moved to London with six suitcases full of bags and bracelets to create a fashion brand. 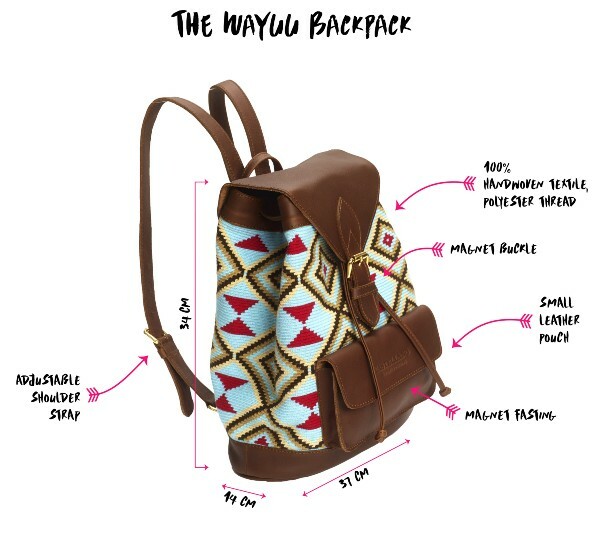 I noticed that a lot of big brands took the hand-created designs from indigenous Colombian people, airbrushed out the origins of the bags, and put an astronomical mark-up on the bags, without passing a fair amount back to the women. I made a vow that for every bag I sold, I would sign the name of the woman who created it, the story of the pattern of the bags, and always pay the women what they ask for. Right now we support three villages with vital services like clean drinking water, and with your help we are going to expand to 15 villages in the next year. Living in that cramped apartment in West London, sharing a room with a yoga teacher, there were days when I wondered if I was doing the right thing. However, over the past three years it’s been amazing to watch how Castellano has grown, and the difference we’ve made in the rural communities in Colombia and Venezuela. From day one I’ve always wanted to create the next Hermes or Prada, but in a way that is sustainable and without exploitation. My Kickstarter is the launching pad I want to use to begin aggressive expansion to touch as many lives as possible. People have told me that one of the best features of my bags is that when people ask them where they got the bags, there is a story stretching back across the world, not “I bought it in Harrods, I think it was made in China”. By supporting my Kickstarter, you are not only buying items that literally no-one else has (so you will stand out), you are helping to create a movement to keep a way of life alive that is under threat. There are only 18 people left in the world who can create the complex weaving techniques we use in our products, and we want to foster and make sure it doesn’t die out. When you touch one of our products, you can feel the heritage and unique workmanship that has gone into every one, and feel the indigenous energy of the patterns come to life. If you don’t, I’ll happily refund you- and you can keep the bag. It’s been a long and stressful journey, but I’m happy I’m on it. Join me and let’s make something amazing happen.